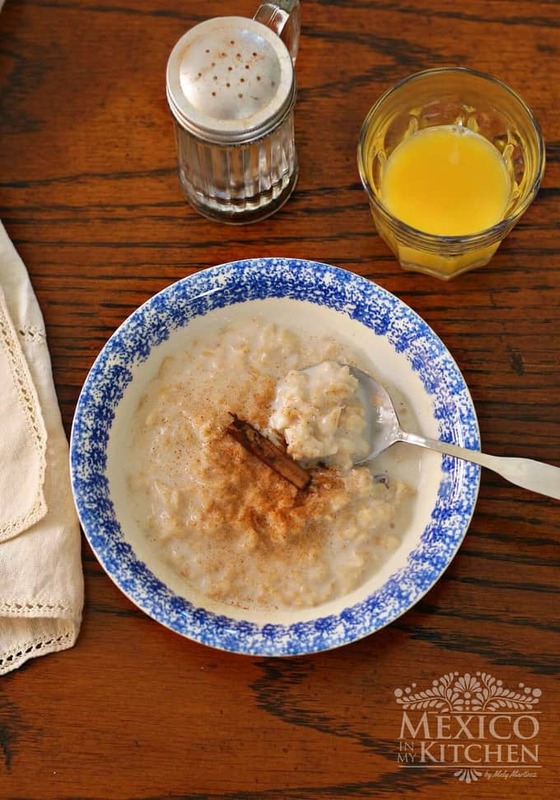 This creamy oatmeal recipe is a basic recipe using oatmeal, milk, cinnamon, and water. The trick to making it creamy lies in the timing with which you add the ingredients. Growing up, my mom would make oatmeal for breakfast very often, and had a very particular way of serving this nutritious dish. She always served it with toasted French bread with butter. To this day, we serve it like that at home, and my siblings also eat it the same way with their families! At home, my son and I love oatmeal. We can have it frequently and not get tired of it. My husband, on the other hand, doesn’t like oatmeal, but not because he hasn’t been exposed to it. He grew up eating oatmeal every single day, and they would serve it piping hot in his house, even if it was the middle of summer. Because of this, he grew tired of it, and says he’s eaten enough oatmeal for one lifetime! This oatmeal recipe is prepared on the stovetop. However, I know that there are many versions that can be made using the Instant Pot, slow cooker, and even the microwave, but this is the old-fashioned way, and I promise you will love it! Nowadays, I know that many families don’t have the time to prepare a breakfast completely from scratch, but thankfully you can make this creamy oatmeal the night before and just reheat it in the morning. I like to make a big batch and store it in the fridge (it also keeps well I the freezer). You can even store it in single-serving containers for when you’re in a hurry. * If you want your oatmeal to be more watery, add ¼ cup more milk. 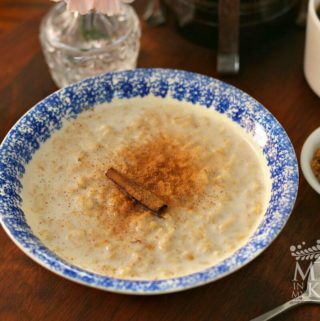 *To sweeten your oatmeal, you can use regular sugar or dark brown sugar. I personally like to add dark brown sugar at the serving time. * Please, if you are lactose intolerant, use lactose-free milk. Or, you can substitute regular milk for a vegan version like oat, almond, or soy milk. Place the two cups of water and the cinnamon stick in a medium-size saucepan and turn the heat to high. Afterward, the water starts boiling, add the Old Fashioned Oats and reduce the heat to medium. Cook for five minutes. After the five minutes, pour in the milk and stir well. Keep cooking for five more minutes, stirring from time to time to keep the oatmeal from sticking to the saucepan. 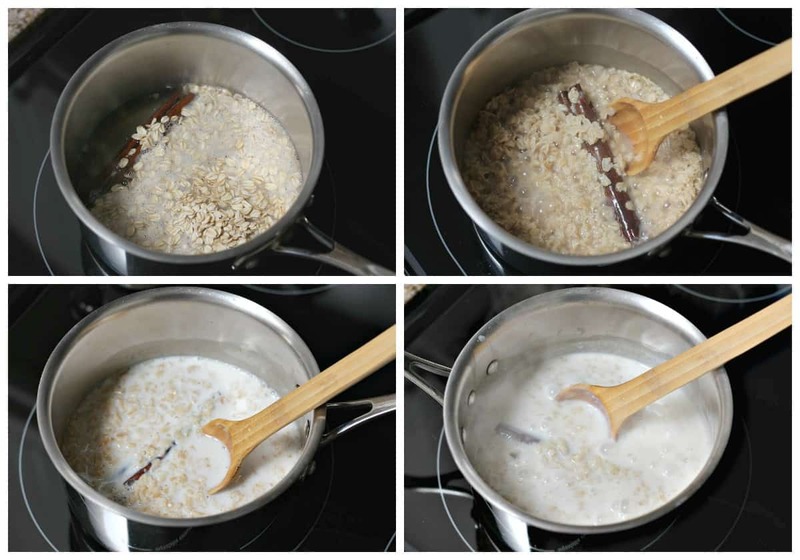 Eventually, the oatmeal will become thick and creamy, then remove from the heat. Serve it in bowls, sprinkle with some ground cinnamon, and sweeten with your sweetener of choice (I recommend dark brown sugar). Good additions to your oatmeal include chopped apples, pecans, and bananas. * Please, if you are lactose intolerant, use a lactose-free milk. Or, you can substitute regular milk for a vegan version like oat, almond, or soy milk. As I mentioned above, this is the way my mom cooked oatmeal at home for my siblings and I. 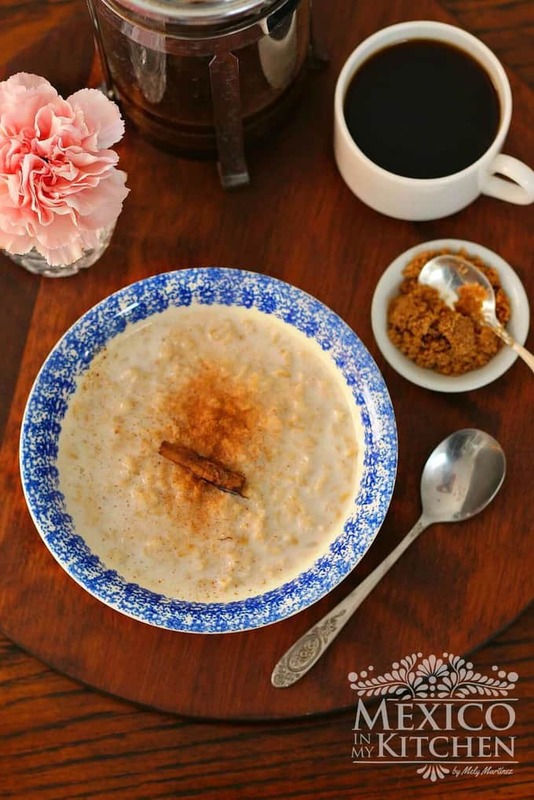 Your mom or yourself might have a special way of cooking oatmeal, or there might be a special ingredient that you add. Please share it with us in the comments section below. Enjoy! Exactly how my mom used to make it.. perfect!! This is exactly how my Grandma would make her oatmeal. With half a buttered francecisto. This would give us the energy needed to get us to lunch. Thank you Mely posting it. So nice to see that other families have the same traditions. Creamy Warm oatmeal with a pan tostado with butter tastes amazing!